Home 2010 Election Bayani Fernando BF Bioman colors Gibo Teodoro Manny Villar Mar Roxas Maskman Nonoy Aquino politician politics Power Ranger Presedentiables presidency candidates Biolitico Man! Savior...savior...savior...?! Who's gonna call when danger comes?! It's no other than...Bioman! Red 1, Green 2, Blue 3, Yellow 4, Pink 5...oops...something had changed! Are they my favorite childhood superheroes? Or I've post a wrong one?! Oh, I see now..! Hmmm...seems that political color is conquering us! Are they the new superheroes that will save us? Or maybe the remake or revival of the hit Bioman or Power Ranger?! Well, if that's the case, how can we call them now? Ah...for this generation let us call them..."Biolitico Man"! The new Bioman superheroes topbilled by our favorite famous politicians! Orange 1, Green 2, Blue 3, Yellow 4, and Pink 5! 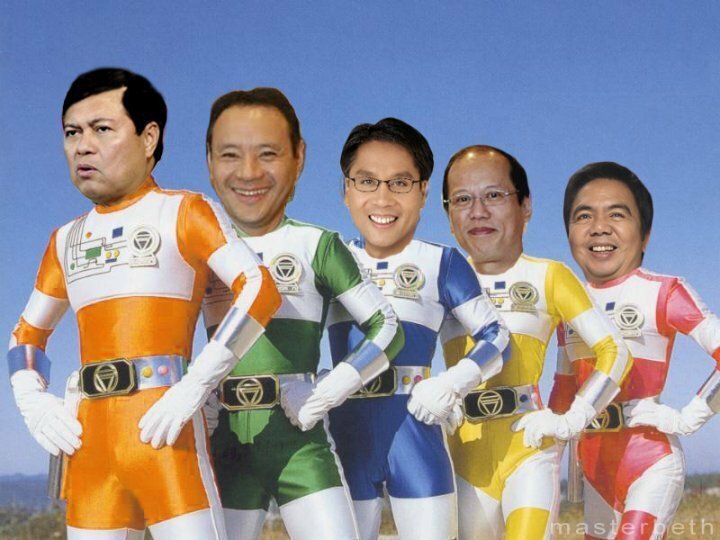 Manny Villar as Orange 1, Gilbert "Gibo" Teodoro as Green 2, Mar Roxas as Blue 3, Benigno "Noynoy" Aquino III as Yellow 4, and of course Bayani "BF" Fernando is Pink 5! Ayos! Kumpleto na ang politcal colors natin. Hehehe!